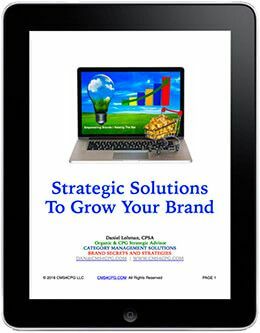 Growing a brand takes work but it doesn’t have to be difficult. There are simple things every brand MUST do. Your success depends on shoppers buying your products but shoppers can’t buy them if they can’t find them. Success = brand strategy + execution. In its most simple terms, business is all about making things and selling things. There are certain things that every brand needs to do. If you don’t do these well, it can determine how long your brand will be around, a week, a month, a year, a decade, or longer. The problem is that there’s so many distractions pulling our attention away from doing the basic selling, that we often overlook, or lose sight of what’s really important. That’s what this podcast is about today. Today’s story is something that every brand can benefit from. Literally every brand, even the big brands have problems here. Over 80% of small brands fail in the natural channel within the first year. That should get your attention. I’m committed to changing this. That’s what this podcast is about. It is about you and it’s for you, helping you get your products on more retailer shelves and into the hands of more shoppers. Well, the way you do that is by making sure that your products are available, wherever your customer’s shop, that they are merchandised properly, priced properly, and that you have distribution that’s going to help support your brand. These are the basics. Execution is the most important aspect of any strategy. Brands need to own this, every aspect of this. You cannot delegate this and then blindly assume that it’s being taken care of. Your success depends on shoppers buying your products but shoppers can’t buy your products if they can’t find them. You need to be involved, it’s your brand. Your brand is a reflection of you. It has your name on it. Out of stocks, any problems with merchandising, any problems with distribution, is a bad reflection on you. 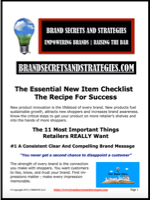 It’s an embarrassment to your retail partners that could hamper your ability to get distribution on new products. Remember, you never get a second opportunity to disappoint a customer, including a retailer. The focus of this episode is to help you avoid the landmines and the many pitfalls that brands fall into. To help you avoid these critical mistakes that can derail and even bankrupt you. Before I go any further, I want to remind you that there’s a free downloadable guide for you at the end of most every podcast episode. I always try to include one easy to download, quick to digest strategy that you can instantly adopt and make your own. One that you can use to grow sustainable sales and compete more effectively. I appreciate your listening. If you like the podcast, share it with a friend, subscribe, and leave a review. Now, here’s Michael J. O’Donnell. Ever wish you just had a roadmap? Well now you do! Don’t miss out on all of these FREE RESOURCES (strategic downloadable guides, podcast episodes, list of questions you need to be asking and know the answers to, weekly newsletter, articles and tips of the week. You will also receive access to quick and easy online courses that teach you how to get your brand on the shelf, expand distribution, understand what retailers REALLY want and address your most pressing challenges and questions. All tools that you can use, AT NO CHARGE TO YOU, to save you valuable time and money and grow your sales today! Image is the property of CMS4CPG LLC, distribution or reproduction is expressively prohibited. 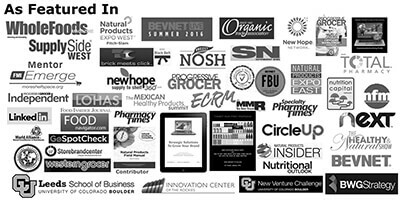 Daniel Lohman, CPSA is Strategic Advisor in the CPG and Organic Industry. His company, Category Management Solutions (CMS4CPG LLC), provides innovative ideas, actionable insights and strategic solutions for companies interested in gaining a significant competitive advantage. He assists companies in expanding their retail distribution and improving their merchandising. His extensive knowledge and expertise reaches far beyond traditional category management and has earned him recognition throughout the industry as an expert, speaker, trainer and thought leader. Daniel can be reached at Dan@CMS4CPG.com. Connect with me on LinkedIn.